We are coming up on jobs day – the months just fly by, don’t they? Expectations are high that the numbers will easily suffice to keep the Fed hiking, and Wednesday’s data raise the risk of substantial upside surprise. 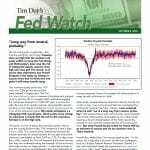 How high will rates go? The answer is of course data dependent, but Powell dropped a hint today by letting everyone know that he thinks the end point is still many months away. Two numbers today stood out. ADP estimates 230k private sector jobs were created in September. The ISM non-manufacturing report measure of employment jumped to 62.4, up from 56.7 in August. 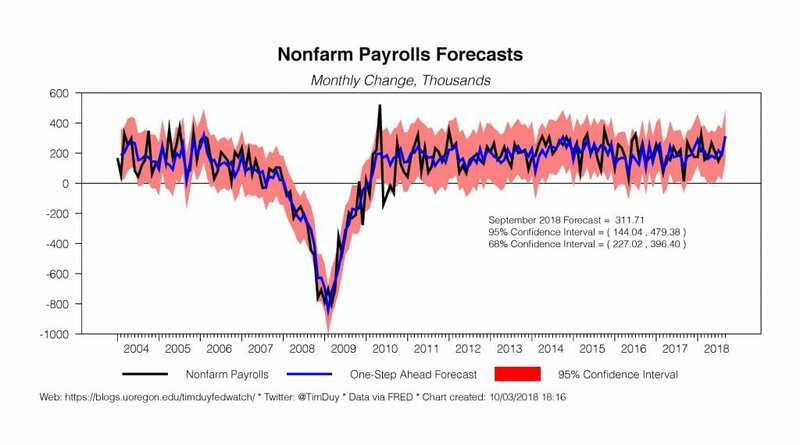 Both indicators suggest the consensus forecast of a 180k NFP gain is on the low side. Be wary of an upside surprise, plus possible upward revisions in the August numbers (a month revised upwards in six of the last seven years). My model anticipates a a whopping 312k payroll gain, which seems crazy strong; my takeaway is simply that the risk to the consensus forecast is on the high side. Of course, it’s not all about the payrolls number. 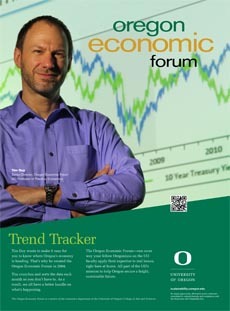 Watch also the unemployment rate. The consensus is that it dips a bit to 3.8%. This is particularly interesting because the median estimate of central bankers for the year end unemployment rate edged up from 3.6% to 3.7%. If it dips lower than 3.8% I expect the Fed will become a bit more nervous that they are underestimating the strength of the economy. Also keep an eye on wage growth – it was high enough in August to convince central bankers that their estimates of the natural rate of unemployment can’t be terribly wrong, but low enough not to kindle concerns of imminent inflationary pressures. Some will reassess the latter position is wage growth continues to climb. Powell also added that “we may go past neutral.” In this sense, he is arguably a bit more dovish than colleagues such as Chicago Federal Reserve President Charles Evans, who reiterated toady his expectation that rates turn restrictive. Still, I see Powell as edging toward admitting what the forecasts reveal. Remember, you don’t have r-star as a guide anymore, but you still have the rate forecasts. You might say that there is a wide variation in the rate forecasts. But it looks like there is a common element – no matter where a central banker thinks neutral is, the majority if not all (not counting St. Louis Federal Reserve President James Bullard), expect rates will climb above their estimate of neutral. In other words, they all see policy as becoming restrictive. Take the forecasts seriously. Handicap the data against the forecasts. Right now, the forecasts tell a hawkish story, especially if you let go of the r-star anchor. And the data doesn’t give reason to think otherwise. Finally, bond bears get their day in the sun as the long end of the yield curve lets go of its anchor. Something had to give in the face of ongoing rate hikes. 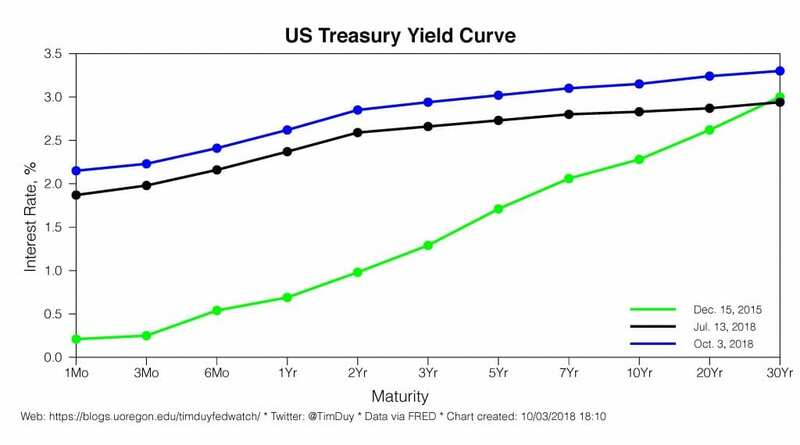 Either the yield curve would soon invert, raising the prospect of recession, or it would start shifting upward on the back of some mix of stronger growth, firmer inflation expectations, and a rising term premium. The latter story currently has the upper hand. That is about as good a story as the Fed could hope for. Bottom Line: You know the bottom line. 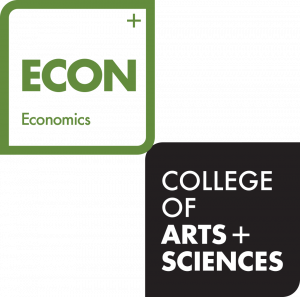 The US economy is on a roll, and that will induce the Fed to keep adding pressure – gradually – to the brakes.